Idea stolen from and severely adapted recipe from Modern Comfort Food and I guess they farm seafood??? Pinches of chipotle pepper to taste and a sprinkling of Phillips seafood seasoning to each bowl. Remove the shrimps’ tails, peels, and heads and place these in a large saucepan. Set the shrimp aside covered and refrigerated if making the both ahead of time. Boil the shrimp (small sauce pan) tails, peels, and heads with the water and lemon juice for 10 minutes. Strain the broth through a fine sieve and set aside for later use in this recipe. In a large Dutch oven, sauté the chopped bacon in the olive oil on medium-high heat for 3-4 minutes. Add all of the veggies except the garlic and sauté, stirring occasionally, for an additional two minutes. Stir in the celery, chopped bell pepper, minced jalapeno pepper, garlic and thyme. Sauté for two additional minutes. Reduce the burner heat to medium, sprinkle on the flour if using, stir well, and sauté for two additional minutes. 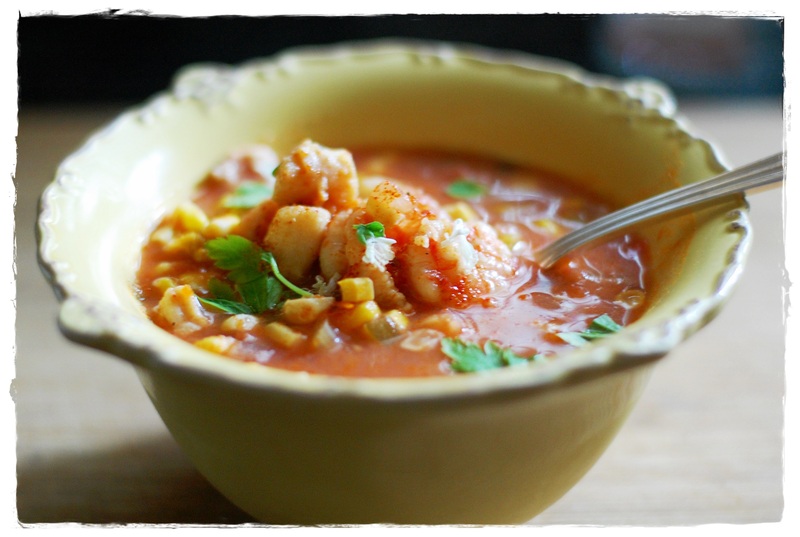 Gradually add, stirring continuously, the cubed tomatoes, their juices, corn cobs and the strained shrimp broth. Simmer for 20 minutes. The cobs thickened the soup and gave it a sweet corn taste, not necessary if you prefer not to use the cobs. 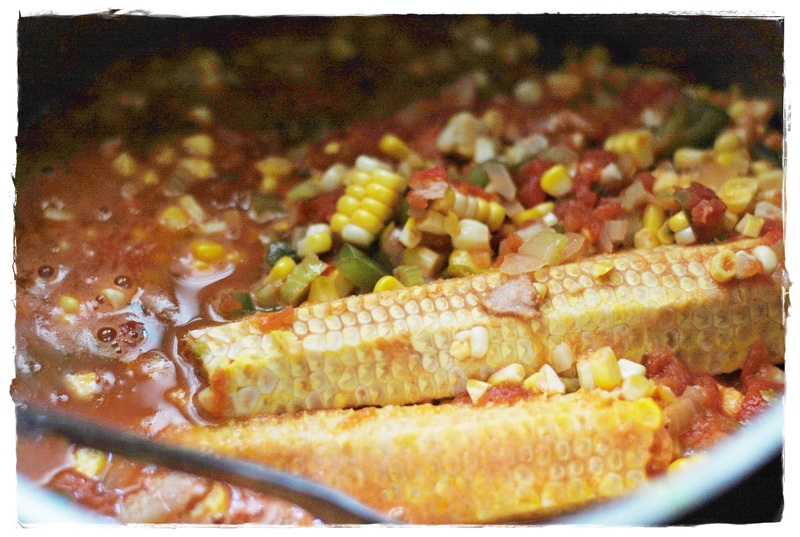 Remove corn cobs and add the corn kernels to the mixture in the Dutch oven and simmer for an additional 5 minutes. Add the reserved raw shrimp, scallops, parsley, cream, salt, and pepper. Simmer for an additional two minutes or until the shrimp and scallops lose their translucence. Taste and correct the seasoning, if needed, by adding salt, pepper, and/or crushed red pepper, to taste. Serves 4 as a main course or 6-8 as a soup course. Musings on poetry, language, perception, numbers, food, and anything else that slips through the cracks. A diary of my pursuits of all things flavorful! Join me on my adventures in the kitchen and in life in general! We will laugh, talk about our successes and failures & figure this all out together! Passionate about cooking and baking and love to share. Yummy food. Pithy commentary. Pretty pictures.